Volume Limited Earphones designed just for kids. By Moki. 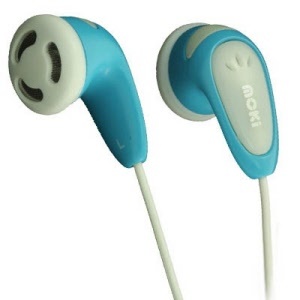 Easy and comfortable to wear, light blue colour and fits most entertainment devices. The buds are designed to fit comfortably without isolating the user from surrounding noise and cannot be forced deep into the ear canel. 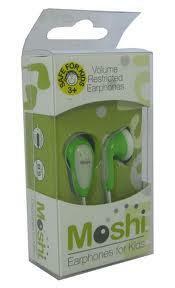 Moshi kids earphones can help prevent damage to hearing caused by listening at volumes considered too loud. Restricted to a specification output of 89 +/-3 decibels. * Please note* As with all headphones the sensitivity rating 89+/- 3db relates to specification output, real-world output may differ slightly dependant on factors such as player power and music sample bit-rates but should remain at a safe level for players less than 30mw for up to 8 hours per day. 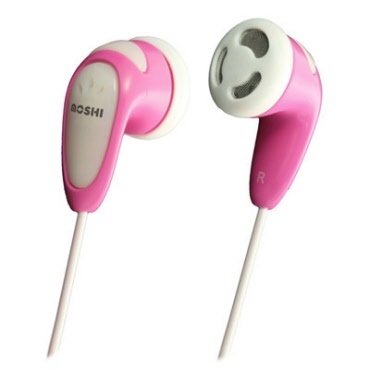 Easy and comfortable to wear, light pink colour and fits most entertainment devices.